The SureFeed Microchip Pet Feeder was sent me to first class after great communication from the SureFlap team. Within days of us emailing each other the package arrived much to my excitement. At first it can appear quite intimidating with a booklet full of instructions and many pages highlighting varying degrees of training (depending on different mog personalities) to get your cat used to the movement of the lid. Once I took a breather and realised I didn’t have to do everything in one go, I relaxed and followed the instructions to the letter. One of the most important things that the booklet advises is for the cat owner to be patient. However much you want your cat to start eating from the feeder straight away it’s good advice to hold back and work with your cats unique personality. Rush things and it could set you back weeks. My cat Kiki (pictured right) is quite nervous of things. 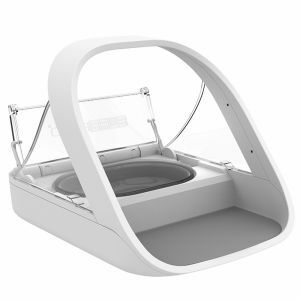 The SureFeed booklet suggests that the bowl (it comes with two different types) is placed near to the feeder to get the cat used to it. Kiki took to her bowl just fine and so the bowl was gradually moved until it was on the ‘step’ of the feeder. Again no problem. The next stage involved Kiki placing her head into the arch so that the feeder could recognise her microchip to store it. This step is the hardest because Kiki was quite nervous of putting her head through the arch. Patience prevailed though and soon she was eating with the bowl in place with no problem. Once she was used to putting her head under the arch of the feeder the next step was gradual programming of the lid movement. The lid movement instructions come in three stages so again the main focus here is to be patient. A few weeks later and it was as if Kiki had been eating from the feeder for months. She wasn’t afraid of the lid movement as much as I thought she would be. Perfect! I can’t really fault this product. It’s the only feeder on the market that has addressed what to do in a multi-cat household when one or more cat needs to eat different food, is on a diet or is on medication. The way it’s designed is genius so hats off to whoever came up with the idea. If I had to come up with a downside it has to be the price at £99.99. Having said that I think it’s an expense worth budgeting for. I have already started recommending this item to many cat behaviour clients of mine and will continue to do so into the future.